The York range of reclaimed tables offers plenty of space, elegant simplicity and has a unique and ornately hand crafted pedestal leg. The reclaimed teak is finished with a black wash and this accentuates the grain and gives overall rustic appeal. The hand finished quality makes this table far superior to more mass produced, mainstream furniture that often suffers from inferior production methods and fails quickly after purchase. Hand cut mortice and tenon joints further reinforced with teak dowels join the separate parts together. This ensures maximum strength with regular use over time. The double reinforced table top is 12cm thick with a decorative overhang that adds to its individuality. 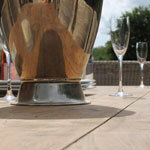 The highlighted grain swirls wonderfully across the top of the table that is smoothly finished throughout. And the fact the timber is reclaimed means it does its piece for the environmental and deforestation overseas. The abundant oil content in the teak offers low moisture uptake and natural protection against chemical attack, fire, insects and the elements all year round. For further information please speak to our Sales Team in the Midlands who are always happy to help.